Posted by admin in activity reports, Caribbean, Soufrière Hills. 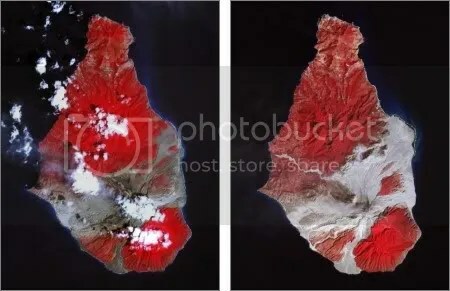 The Montserrat Volcano Observatory has released more details of the dome collapse that took place at Soufrière Hills volcano on 11 February 2010. The pyroclastic flows generated by the collapse felled many trees and levelled buildings (in evacuated areas) to the north-east of the volcano, and extended the coastline by 650 m, and some of the flow deposits have a thickness of 15 m. The collapse has left a deep collapse scar on the northern side of the summit, and the MVO reports that ‘It is currently unclear whether there is a new dome growing inside the crater’. The Soufrière Hills activity bulletin issued by MVO for 12-19 February gives more detail on some aspects of the 11 February event. The collapse scar on the volcano’s northern flank is reported to be approximately 300 m wide, and there is a separate crater of similar diameter at the summit of the lava dome. A temperature of 470 degrees centigrade was measured at one place on the pyroclastic flow deposits on 15 February, and the MVO notes that ‘these deposits will retain such high temperatures for months’. As for new dome growth, ‘It is at present unclear whether there is any new dome growth within the crater. However FTIR (Fourier Transform Infrared) measurements on the afternoon of the 17 February gave a hydrochloric acid /sulphur dioxide ratio of 0.76, which is consistent with quite slow extrusion of lava on that day’. Photographs of the dome collapse and aftermath can be found at the MVO’s excellent Flickr pages. Posted by admin in activity reports, Caribbean, eruptions, NASA Earth Observatory, Soufrière Hills. UPDATE 16 February 2010. The image of Soufrière Hills discussed below is today’s Image of the Day at the NASA Earth Observatory. Many thanks to Robert Simmon of the NASA Earth Observatory who forwarded this image (other versions at various pixel sizes available at NASA’s Rapid Response site) of the Lesser Antilles captured by the MODIS aboard NASA’s Terra satellite at 17:20 UTC on 11 February 2010 – just in time to catch the dome collapse event of that day at Soufrière Hills volcano on Montserrat. A cropped and labelled version of the image is below. The dense, ashy plume thrown up by the dome collapse is clearly visible, piling up over Montserrat and trending to the east. 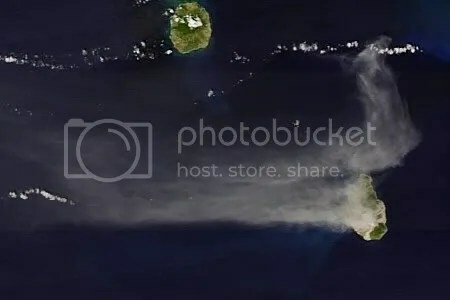 The event began at about 17:00 UTC according to Washington VAAC, so when this image was captured the plume had not yet made its way far across the ocean. Subsequently ashfall from this event occurred to the south-east, in Guadeloupe and Dominica, and in Martinique, St Lucia and Barbados. The ash caused extensive disruption including flight cancellations. Ash from earlier activity can be seen floating on the surface of the sea to the north and east of Montserrat, producing a faint grey-green stain. Quick note: there was a large partial dome collapse at Soufrière Hills volcano this afternoon, beginning at 12:35 local time and lasting 55 minutes. Pyroclastic flows descended to the north-east and reached the sea, and the resulting ash plume reached 50,000 feet a.s.l. (15,240 metres). Report available at the Montserrat Volcano Observatory website. UPDATE. Caribbean airline LIAT has suspended flights in and out of Antigua because of ash clouds from Soufrière Hills. Washington VAAC reports ‘large eruption at 1700Z’ (i.e. 17:00 GMT) with ash emissions reaching FL500 (50,000 feet or 15,240 metres), confirming the earlier pilot reports quoted by MVO. The Soufrière Hills webcam (which can be seen on the MVO front page) seems to show a distinct change in the topography of the summit as a result of the collapse. Well, as of 22:44 GMT the webcam image is completely dark – it may be very ashy there, or there is a technical fault, or the camera has been knocked out by the volcano’s activity. FURTHER UPDATE. The Washington Post, quoting an AP bulletin, says that 20 people were evacuated during this event, which involved (according to MVO) the largest-scale ejection of material from the volcano for four years. MVO’s Paul Coles reports that 10-15% of the lava dome has been removed by this collapse. Soufrière Hills continues to produce a great deal of activity. The Montserrat Volcano Observatory reports that a significant vulcanian eruption occurred at Soufrière Hills volcano on Montserrat on Friday 5 February 2010. The event began at 13:49 local time and last about 7 minutes, sending pyroclastic flows down the volcano’s flanks to the west that swept across the site of the former capital of Plymouth and reached some 500 m out to sea. The resulting plume is reported to have reached an altitude of around 6,700 metres (21,000 feet). This was clearly a spectacular event, but fortunately not too disruptive as the easterly winds ensured that ashfall was limited to uninhabited areas. 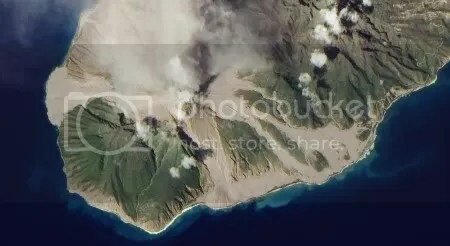 NASA’s Earth Observatory has been following the Soufrière Hills eruption with a great collection of fascinating images since the volcano saw a resurgence of activity in the autumn of 2009. 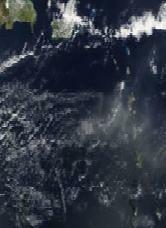 The latest image is a crystal-clear shot from the MODIS aboard NASA’s Aqua satellite, captured on 31 January 2010 (detail above), showing the light-grey ash cloud produced by the active Soufrière Hills lava dome swirling around Montserrat to the north and west. Recent activity has seen most of the island affected by ashfall, according to reports from the Montserrat Volcano Observatory. Soufrière Hills volcano on the Caribbean island of Montserrat has been vigorously active recently, with the growing lava dome producing collapses, explosions, pyroclastic flows and considerable ash emissions. Since 19 December south-easterly winds have caused ashfall in the inhabited north-west of the island. On 20 December the Montserrat Volcano Observatory reported ‘heavy ashfall in many inhabited areas of northwestern Montserrat on Saturday 19 December’ and forecast that ashfall would continue through Sunday and until at least the early hours of Monday. 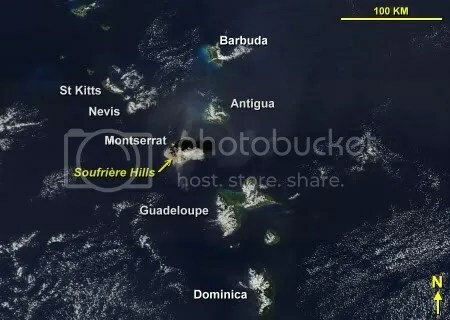 According to reports on the Caribbean Hurricane Network, ash from Soufrière Hills reached islands north-west of Montserrat including St Maarten, Saba and Nevis. Caribbean airline LIAT has issued a warning that air travel between St Kitts, Nevis, St Maarten, Anguilla and Guadeloupe may be affected by Soufrière Hills ashfall.